If you’ve ever seen a court stenographer in court, or on movies and television shows, you may have wondered what they really do. We are the person who sits in the court room or in a deposition, who takes down every spoken word during the proceedings. We prepare official transcripts for use by attorneys, judges and litigants. These transcripts are used as the official record of the events that took place during the deposition, hearing or trial. We are responsible for certifying that what has been entered is accurate and true to the best of our ability. What preparation does a reporter go through to begin a career in court reporting? To become a court reporter, we have gone through college programs that teach us the skill of steno writing at a very high level of speed and accuracy. It can take 2 to 5 years to reach the level of skill that is required to receive certification to work as a court reporter. We have to demonstrate that we can write at a speed of 225 words per minute, with 97 percent accuracy. Court reporters need excellent communication, organizational and time management skills. We have the ability to work in a high-pressure environment. We know how to work under a deadline. The documents we prepare are the only official account of the court proceedings and are vital to the credibility of the judicial system. We take this responsibility very seriously. Who hires a court reporter? Attorneys and corporations hire freelance reporters when they have a need for an accurate and complete record of proceedings, such as depositions, board of director meetings, stockholder minutes or other legal proceedings. 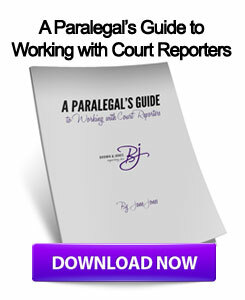 How do court reporters make the record? Court reporters use a computer and stenotype machine to take down the spoken words they hear. The stenotype machine allows the reporter to use a form of shorthand by using sounds of words to record data. The computer uses software called computer-aided transcription to translate the information into English. What technology do court reporters need to know? Over the years, technology has changed the way in which we do our job. Court reporters are using more advanced technology to provide instant transcription in rough draft form on computer screens while the proceeding is in session. This is called realtime translation. This technology is also used to allow the deaf and hard-of-hearing community access to what is happening in a live classroom, meeting or theater. This skill is also used to caption live television shows, such as newscasts. Court reporting technology now often involves videoconferencing, live internet streams, specialized print programs for transcript formatting, just to name a few technologies. Our profession is a quiet one. We are always in the background, patiently taking down every word that is spoken, sometimes working in very difficult, emotional and trying circumstances, but we always protect the record. We know how important the role is that we play in the legal system, and we are proud to be the guardians of the record. This entry was posted on Monday, July 1st, 2013 at 6:34 am	and is filed under All Posts, Court Reporting. You can follow any responses to this entry through the RSS 2.0 feed. You can skip to the end and leave a response. Pinging is currently not allowed. 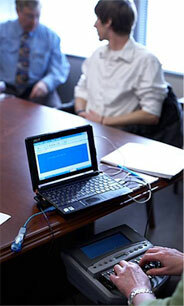 Although court reporters are “quiet,” we speak loud and clear to individuals through our realtime capabilities. We are a very unique group!! !